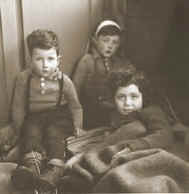 Jewish children rescued from Theresienstadt. The inspiration for this lesson comes from the Holocaust Museum Houston which has created the Butterfly Project. In an effort to remember the 1.5 million innocent children who perished in the Holocaust, Holocaust Museum Houston is collecting 1.5 million butterflies. The butterflies will eventually comprise a breath-taking exhibition for all to remember. Teachers may facilitate the activity by collecting as many butterflies as possible and sending them to The Education Department of the Holocaust Museum Houston at 5401 Caroline St., Houston, TX 77004. Students discover, through poetry, the "human faces" behind the Holocaust, especially those of the 1.5 million children who were killed. Students appreciate the creative skills of other children. Students learn, both cognitively and emotionally, that the majority of children interned at the concentration camp at Terezin were liquidated in the death camps. Students further their explication skills, especially insofar as they are able to revise and reframe their thinking about a single text. Students discover through experience that their own creativity and academic pursuits serve as valuable responses to the Holocaust. Each student selects one poem from the book I Never Saw Another Butterfly. (Class sets of the books are available in the high school language arts trunk from the Holocaust Museum Houston, which can be delivered to your school free of charge. Contact the Museum at trunks@hmh.org. They write out the poem and, in class, write a brief analysis of it. (Explication skills have been developed throughout the year). Students take home their poem and informal explication. Students are asked to reread the poem again, "under a tree, in a tree fort, or somewhere other than the place where you normally do your homework. This is not normal homework." They are also asked to reread the informal explication that they did in class, reconsidering their ideas in some depth. At their desks or wherever they normally do homework, students type out and completely overhaul their explications. They are told that not only will they be graded on what they say and how they say it; they will be given high marks for the extent to which they revise their work. Students will lose points if many of their sentences from the original appear in the revision. Students are encouraged to use earlier tools to guide them, such as FAQs Regarding the Art of Explication (PDF Document) and a midterm exam in which they explicated a short story by survivor Tadeusz Borowski. In the next class session, students are prepared to submit typed copies of their poems, their revised and formalized explications (1 to 2 pages), and their original informal explications. Students are given art materials and are asked, in class, to create butterflies in honor of their poets. These butterflies are placed on a large wall in the classroom-or they may be hung from the ceiling, if possible. In a separate class session, I have students informally present their selected poems, explications, and butterflies to the rest of the class. Weeks later, after they have grown accustomed to seeing their butterflies adorn the classroom, I secretly take down and place in a drawer all of the butterflies representing those poets who did not survive. Usually, there are only 2 or 3 butterflies remaining. You can imagine the students' responses when they come in to class to make this visual, visceral discovery. In our follow-up discussion, students come to realize the significance of the Holocaust in ways that our simple book discussions could not provide. I also read to them some adult poetry by an acquaintance of mine who DID survive Terezin. A sample explication and model essay (PDF Document) by student Alana Dulaney is presented here. I Never Saw Another Butterfly: Children's Drawings and Poems from Terezín Concentration Camp, 1942-1944. New York: Schocken Books, 1993. Art supplies: construction paper, tag board, scissors, glue sticks, glitter glue, pens, colored pencils, etc. Page of homework instructions (see "Pedagogy" list above). While the artwork is not graded, the students are assessed on their understanding through follow-up discussions and subsequent writings. The formal explications of the poems, which I do grade, tend to be much stronger than those generated by the students on adult texts. Through their connection to the poetry of other children, students demonstrate a new or renewed interest in poetry in general. If any student falls short of the mark, I meet with him or her to discuss ways of revising their explications to deepen their insights and improve their own use of language.